In the wake of Hurricane Maria, Puerto Rico’s health centers are facing extraordinary need, while most private clinics are shuttered. As of mid-October, 83 of 93 health center sites are open, but conditions are far from normal. A new infographic produced by researchers at the Geiger Gibson/RCHN Community Health Foundation Research Collaborative Milken Institute School of Public Health depicts the situation. WASHINGTON, DC and NEW YORK (September 14, 2017)—If Congress fails to renew a critical fund for community health centers, which is due to expire at the end of the current federal fiscal year on September 30, these safety net providers stand to lose 70 percent of their federal grant funding by 2018. As a result, an estimated 9 million people could lose access to health care, according to a new infographic produced by researchers at the Geiger Gibson/RCHN Community Health Foundation Research Collaborative at the George Washington University’s Milken Institute School of Public Health (Milken Institute SPH). 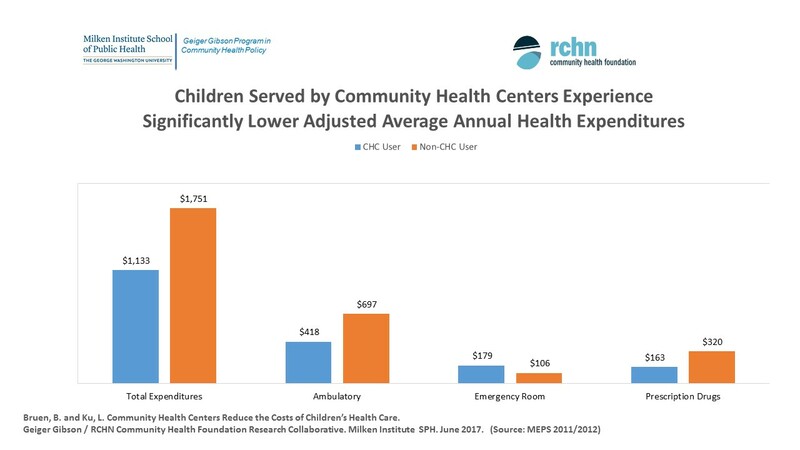 Compared to doctor offices and other providers, community health centers lower the cost of children’s primary care by approximately 35 percent, according to an analysis published by researchers at the Geiger Gibson/RCHN Community Health Foundation Research Collaborative at George Washington University’s Milken Institute School of Public Health (Milken Institute SPH). On average, health centers saved $618 in overall medical costs per child, per year with total costs of $1,133 per year for CHC users compared to $1,751 for non-users. The analysis is the first to show that community health centers (CHCs) provide care for children at a significant savings. The number of veterans served by community health centers has increased by 43 percent in less than 10 years, according to an infographic produced by researchers at the Geiger Gibson/RCHN Community Health Foundation Research Collaborative, which is based at the George Washington University’s Milken Institute School of Public Health. This finding and other data presented in the infographic indicate that community health center locations help improve access to care for veterans across the country. Updated infographic shows the scope and impact of America’s community health centers, which have doubled the number of people served in just ten years and continue to serve as essential providers and community-based employers. Our new infographic offers a snapshot of the new UDS data, and shows that nearly 23 million people were served by community health centers in 2014. Within just one year (2013-2014), the total number of patients served by health centers increased by more than 1.1 million patients. Meanwhile the number of health center patients with health insurance increased by 2.3 million and the number of uninsured patients declined dramatically, by 1.2 million. To cap off National Health Center Week 2014, we’ve created a new infographic illustrating the impact of Community Health Centes on the US health care system & in communities across the country. In recognition of National Health Center Week, view the RCHN Community Health Foundation’s latest infographic illustrating the diverse populations served by CHCs across the country. Primary Care Funding Cliff: Will Funding for CHCs keep up with patient demand? Depending on the outcome of key federal and state policy decisions: support for health center funding (either through a continuation of mandatory funding or an increase in discretionary appropriation levels) and state implementation of Medicaid expansion could potentially impact the number of patients who could be served in health centers in 2014 and 2020.